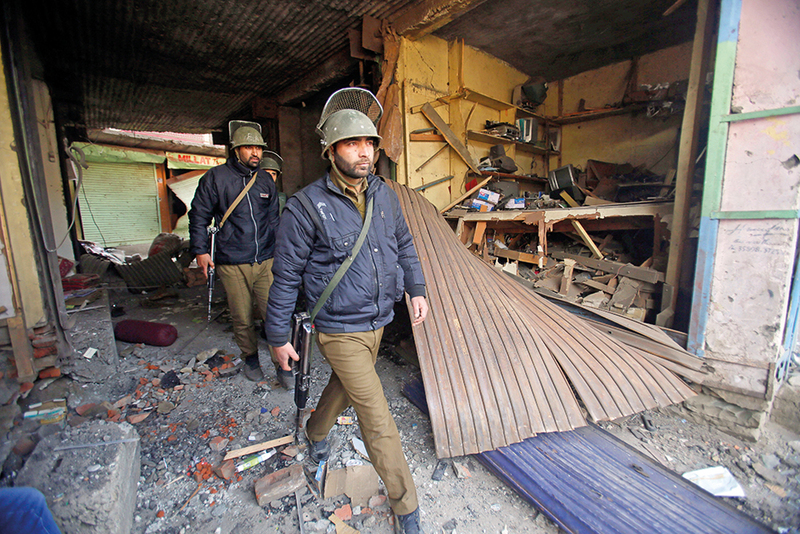 Srinagar: Four policemen on patrol duty were killed on Saturday in an improvised explosive device blast by militants in a market in Sopore township, the first IED attack in Kashmir since 2015. The four personnel belonging to Indian Reserve Police-3rd battalion were on duty in the township in north Kashmir, 50 kilometres from here, when the IED planted by militants in the market, which was shut due to a separatist sponsored strike, went off, police said. The Jaish-e-Mohammad (JeM) militant outfit has taken responsibility for the attack, but Kashmir’s police said it will have to verify that claim. 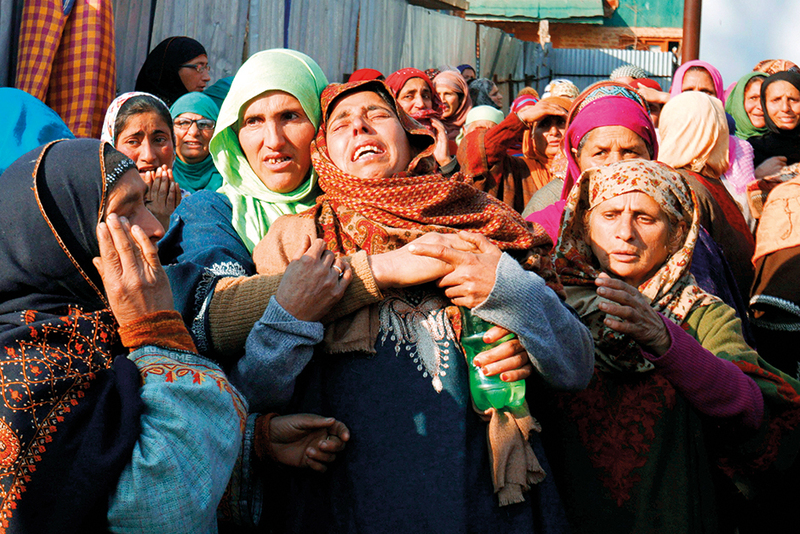 The slain personnel were identified as assistant sub-inspector (ASI) Irshad Ahmad, a resident of Doda; Constable Ghulam Nabi, a resident of Rohama Rafiaabad area of Baramulla; Constable Parvaiz Ahmad, a resident of Vilgam, Handwara; and Constable Mohammad Amin, a resident of Sogam, Kupwara. Additional Director General of Police (ADGP) Munir Khan said the use of IEDs by militants had ended since 2015 and the security forces will have to chalk out a new strategy in the wake of the blast. Denouncing the killings, Jammu and Kashmir Chief Minister Mehbooba Mufti urged the people to work shoulder to shoulder to break the “vortex of violence” in the state. These young policemen were killed when they were on duty to protect the people in the town. It is highly unfortunate, Mufti said. Jammu and Kashmir Congress chief GA Mir condemned the killing and claimed the incident had exposed the “tall claims” of the Mehbooba government about the Kashmir situation being normal. Giving details of the incident, ADGP Munir Khan told reporters that shops were closed and vehicles were off roads due to the strike in Sopore when the militants ambushed the police team. “Our normal law and order deployment reached the lane between ‘Chotta Bazaar’ and ‘Bada Bazaar’. There was an IED blast in which four of our boys were martyred,” said Khan, who was recently promoted as additional director general of police, but continues to hold the post of inspector general of police (IGP) Kashmir. He said the security forces will have to think about their next course of action. “We will put our heads together and chalk out some new strategies to tackle this thing,” he said. The JeM, in a statement to a local news agency here, claimed responsibility for the attack. A wreath-laying ceremony was held at District Police Lines Sopore to pay homage to the slain personnel. Khan led police officers and soldiers in paying floral tributes to the martyrs, a police spokesman said here. The spokesman said ASI Irshad Ahmad is survived by his elderly mother, wife, two sons and two daughters. Constable Mohammad Amin leaves behind an aged mother, wife, four-year-old son Tajam-ul-Islam, a brother and three sisters, while constable Parvaiz Ahmad is survived by an elderly father, wife, three-year-old son Mohammad Noman, an unmarried sister and three brothers, the spokesman said. He said constable Ghulam Nabi has aged parents, pregnant wife, four-year-old daughter Faheeqa Nabi, two brothers and two unmarried sisters.